I have a reputation for being very organized, which is a good one to have, and one which my customers at NASA and ScienceCheerleader.com have come to value. However, such was not always the case…and, I should note, I make no claims to being perfect in this regard. One of the things that set me on the road to hyperorganization was the need for constant reports. While small- and medium-size companies do not always require weekly, monthly, quarterly, or annual reports of activity, large companies certainly do. Disney, for example, would ask for a weekly report of what I’d done, and I would usually forget things. I got organized out of self-defense. Since the “report” was in the form of an email anyway, I would start up a draft first thing on Monday morning, then add completed actions to the email as soon as I finished them. I also made a habit of saving my reports in a designated folder because inevitably I’d have to reuse the information when it came time for monthly or quarterly reports. I have kept a journal since I was 18 years old. The format/book size has changed over the years before I received an exquisite refillable leather journal cover (hardcover journals run ~$5 at Barnes & Noble) from a couple of dear friends. 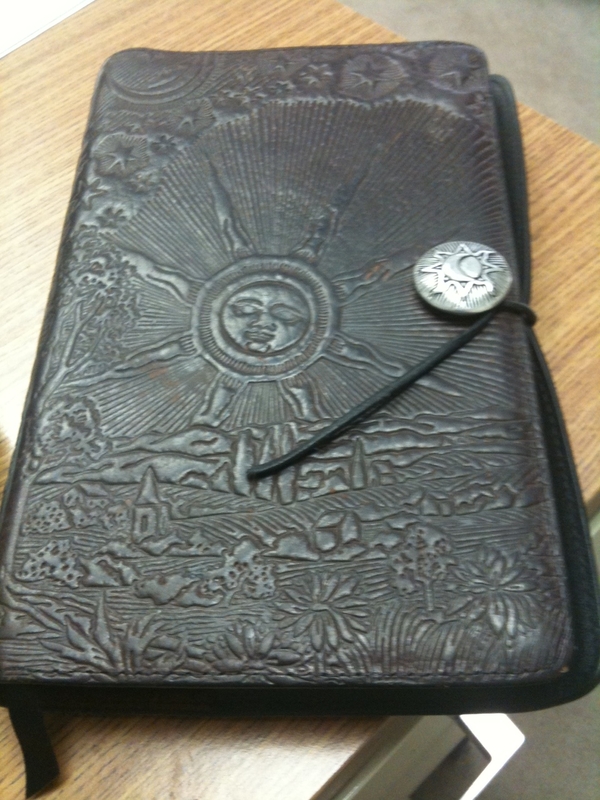 You can pretty much see the journal in my claw anywhere and everywhere. I buy my own refills because I prefer that any comments I make remain my property, not my company’s or the government’s. So the journals have become a mishmash of personal and professional stuff. My meeting notes are in there, but also my random thoughts, story ideas, doodles, and gosh-knows-what-else that crosses my mind. I go through a journal, writing on both sides of the page, in about two months. However, there have been times when the journal failed me. Because the journal IS a mishmash of many different things, there have been occasions when I wrote down a job assignment or due date and then forgotten it. Worse, I missed a couple deadlines for a customer I really should NOT have irritated. I recovered, but I had to set up another document in self defense—in this case, a Microsoft Excel spreadsheet. In this case, I developed a spreadsheet for tracking tasks: Product, Customer, Assigned Date, Due Date, and Notes (usually status). I also color-coded the cells of tasks based on status: Completed, In Work, Not Started, Canceled, Delegated, and Urgent (as follows). This document, too, remains open all day so that I can keep things as up to date as possible. The trick was disciplining myself to make notes on product statuses as soon as I’d taken an action. This became more critical depending on the level of the customer the action was for or the proximity to the deadline. After lunch, I’d walk up to Tina the PowerPoint Wiz and ask her about the status, then walk back to the cubicle, immediately make the appropriate note, and then pass on the status to my supervisor. There’s more than organization at stake here: sometimes documents can get hung up on a different customer’s desk, at which point I’ve let Customer A and Customer B duke it out for possession of the deliverable. Regardless of how you decide to set up your system for keeping track of the products you deliver, you should have some system. It could be post-it notes. It could be paper folders. I happen to be excellent at keeping thorough, voluminous, and well-organized electronic folders; however, my paper-handling skills are starting to degrade as I do more and more editing on the screen. I don’t like keeping all those paper drafts around because they take up space on the desk or in the filing cabinets, so I just hold onto the marked-up electronic drafts for a year or more after the final product has gone out. The computer doesn’t mind unless it fills up, and I’ve managed to do that a few times over the years. In any case, there are plenty of tools out there that can make it very easy for you to coordinate the stuff you have to do—why not use them? This entry was posted in documents, technical writing and tagged journal, organization, reporting, task log. Bookmark the permalink.